Citizenfour, a documentary about the rise of mass, suspicionless surveillance and about the dissidents who have worked to expose it, naturally centers on Snowden; and most of the film concentrates on eight days in Hong Kong, during which Poitras filmed while the Guardian reporters Glenn Greenwald and Ewen MacAskill introduced themselves, conducted searching interviews and conversations with Snowden, and came to know something of his character. The focus on a single person is consistent with the design of all three of the extraordinary films in the trilogy that Poitras has devoted to the war on terror. The first, My Country, My Country (2006), covered a short stretch in the life of an Iraqi doctor, Riyadh al-Adhadh, during the American occupation of Baghdad. In the months before the election of January 2005, al-Adhadh was beset by a family in bad straits and by patients whose physical and emotional state had suffered terribly in the war. He resolved at that exigent moment to help his country by standing as a candidate for the assembly. When his Sunni party withdrew from participation, he was left disappointed and uncertain, his commitment invalidated by the very people he hoped to serve. As if between the lines of the film, it emerges that Abu Jandal himself—charismatic, masculine, a hero to the intellectual Muslim radicals who seek him out, yet touchingly gentle in the work of raising his five-year-old son—had been closer to bin Laden than the relative who was sent to Guantánamo. And even that is not the end: the protagonist is not what he seems at second glance any more than at first. He was once a committed jihadist, yet he was also full of doubts and capable of acting on his doubts. The film leaves him, as the earlier film had left the Iraqi doctor, uncertain and in suspense. In the same way, we are left without a finished story at the end of Citizenfour. Snowden departs Hong Kong for Moscow, under the protection of human rights lawyers, hoping to fly from there to a Latin American country that will offer him refuge (probably Ecuador). But as we now know and the film reminds us, the US State Department revoked his passport and Snowden in Moscow is still in limbo. Though the film, in a kind of denouement, shows him reunited with his American girlfriend, visited by a political ally, Glenn Greenwald, and encouraged to hear that another whistle-blower has cropped up and disclosed the exorbitant scale of the American “watch list,” it is hard to know where his story will end. Citizenfour gives a setting for Snowden’s action through its portrait of several other vivid personalities. William Binney, the mathematician who conceived the NSA’s Stellar Wind surveillance program in late 2001—thus laying the foundation for the subsequent programs of NSA data collection—tells how he quit the agency for reasons of conscience similar to Snowden’s when he realized that the government was turning its powers inward to spy on Americans. Greenwald, the polemicist against the war on terror, before taking up the case of Snowden had exposed the abusive treatment of Bradley Manning in solitary confinement in Quantico, after his arrest for leaking the largest collection of classified documents in US history; we see Greenwald working in his house in Rio de Janeiro, and later addressing a human rights group with vehemence in fluent Portuguese. Finally, Jacob Appelbaum, a freelance critic of surveillance, is seen in his element as an educator and agitator, wondering how it is that so many people associate freedom with privacy, while the same people accept the idea that privacy has been abolished. In an interview about Citizenfour with the New Yorker reporter Jane Mayer, Snowden has said that his action seemed to him necessary because the American officials charged with the relevant oversight had abdicated their responsibility. He meant that President Obama, Attorney General Eric Holder, and the intelligence committees in the House of Representatives and the Senate had utterly failed to guard against extraordinary abuses of the public trust under the pretext of national security. Nor had they undertaken the proper work of setting limits to government spying on Americans consistent with the spirit of the First Amendment and the letter of the Fourth Amendment. “Abdicated” is the right word. Obama, Holder, and the heads and members of the relevant committees acted as if the machine was working; as if they had no responsibility to watch, with care, the expansion it was undergoing; as if it was not their business to restrain its operations with some attention to the processes of informed consent. Snowden is often called a “fanatic” or a “zealot,” a “techie” or a “geek,” by persons who want to cut him down to size. Usually these people have not listened to him beyond snippets lasting a few seconds on network news. But the chance to listen has been there for many months, in two short videos by Poitras on the website of The Guardian, and more recently in a full-length interview by the NBC anchorman Brian Williams. The temper and penetration of mind that one can discern in these interviews scarcely matches the description of fanatic or zealot, techie or geek. An incidental strength of Citizenfour is that it will make such casual slanders harder to repeat. Nevertheless, they are likely to be repeated or anyway muttered in semiprivate by otherwise judicious persons who want to go on with their business head-down and not be bothered. It must be added that our past politics give no help in arriving at an apt description of Snowden and his action. The reason is that the world in which he worked is new. Perhaps one should think of him as a conscientious objector to the war on privacy—a respectful dissident who, having observed the repressive treatment endured by William Binney, Thomas Drake, and other recent whistle-blowers, does not recognize the constitutional right of the government to put him in prison indefinitely and bring him to trial for treason. His action constitutes a reproach to the many good citizens who have learned what is happening and done nothing about it. That, too, is surely a cause of the resentment that has a hard time finding the appropriate adjectives for Snowden. as implied by the Fourth Amendment to the Constitution, cannot be forced to give way to the asserted exigencies of law enforcement. The use of electronic surveillance constitutes just the kind of indiscriminate general search that helped to bring on the American Revolution and that the framers of the Constitution were alert to guard against. In the name of necessity this grant of power would permit an unscrupulous policeman or prosecutor to pry into the private lives of people almost at will. Knowledge that this was so would certainly inhibit the free expression of thoughts and feelings that makes life in our society worth living. Packer’s understanding of the internalized character of free expression is close to Snowden’s language about the freedom of the Internet before it was watched. But as the film illustrates in detail, Snowden does not in fact oppose police work or the arrest of people dangerous to the country. The trouble, he says, is that the NSA has overseen the almost immeasurable expansion of “a system whose reach is unlimited but whose safeguards are not.” At the same time, Snowden goes further than many who call themselves libertarians. He believes that the American government has no more right to spy on private individuals in other countries than it does to spy on citizens of the United States. 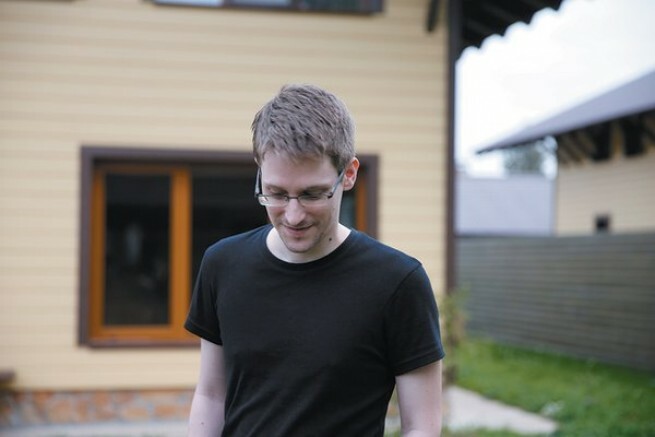 On the evidence of Citizenfour, along with the Harvard Law School conversation and other public statements, Snowden appears to have no objection to the issuing of a legitimate warrant—in the language of the Fourth Amendment, a legal demand for the search of a particular site or seizure of a particular communication—so long as it is issued “upon probable cause, supported by Oath or affirmation” specifying the site to be examined and the materials that are looked for. Concerning Snowden’s political views, beyond his opposition to warrantless surveillance, very little is known; and this seems a matter of choice on his part and not an accident. Consider the statement he made in his meeting with human rights groups in Sheremetyevo International Airport. These remarks have been quoted, out of context and abridged, as a sign of naiveté, corruption, or infatuation with tyrannies outside the Western orbit, but they are nothing of the sort. Snowden at the time was marooned in the airport in Moscow, to which he had flown on June 23, on the first leg of a journey to an unknown destination before the State Department canceled his passport. He had applied to Ecuador and Russia for political asylum, but Ecuador had delayed its decision and Russia initially rejected his bid. Nevertheless, these were among the few countries to indicate any resistance to the American pressure to close all doors against him. When, on July 3, the US diverted to Austria the presidential plane of Bolivia, under the suspicion that Snowden was a passenger, it can only have sharpened his sense of peril. This was the moment he chose to issue some words in praise of the specific support for human rights shown by those countries (“including Russia, Venezuela, Bolivia, Nicaragua, and Ecuador”) from which he hoped for continued help. On August 1, he left the airport, having been granted temporary asylum in Russia. His apparently broad but actually narrow statement on human rights was made on July 12, 2013, just nine days after the US forced down the Bolivian plane and nineteen days before Russia allowed him to leave the airport. The relevant rights, for him, were his own right to unfettered speech as a whistle-blower and his right of asylum as a political exile. Once these facts are understood, an edifice of innuendo may be seen to crumble. The idea that Snowden loves to spout opinions is false. The report that he talks about himself incessantly is equally false. He did speak of himself, in Hong Kong and again in Moscow, when his life and freedom were in immediate jeopardy. Others in a similar situation have been known to do the same. But apart from the constitutional issue in which he is now inseparably involved, Snowden’s politics remain elusive. They have been made the subject of commentaries on Citizenfour but they are not the subject of the film. He decided to come forward early and declare himself by name, notwithstanding an initial reservation by Greenwald, and Citizenfour shows that discussion to fascinating effect. Snowden supports his resolution with a thought that has clearly taken time to mature. He realizes that if he keeps his identity a secret, the government will rally all its powers and those of the media to convert the treacherous and hidden leaker into the subject of the story. His intuition is that the best way to counter such a distraction will be to make the story personal right away, but to render the personal element dry and matter-of-fact. He will do this in the most unobtrusive and ordinary manner. He will simply admit that he is the person and spell out the few relevant facts about his life and work. The undeclared subject of Citizenfour is integrity—the insistence by an individual that his life and the principle he lives by should be all of a piece. Something resembling an aesthetic correlative of that integrity can be found in the documentary style of Laura Poitras. Her signature is honestly marked in Citizenfour with the briefest of narrative passages and quotations from e-mails. Her camera sits still for minutes at a time, without the jumped-up authenticity of the hand-held technique. Like the exemplary documentary filmmaker Frederick Wiseman, she is interested in the impact of institutions on the individuals whom they condition; but where Wiseman’s films may (in passing) show the actions and suffering of a person of extraordinary interest, he seldom directs our attention for long toward the individual case. The genre of the collective institutional portrait—of a hospital for example, or a high school—does not allow it. Poitras has the same double focus, but with the emphasis reversed. In watching her films, one is always aware of the impact of the large institution on the person, but the person stands at the center of the portrayal. And in her trilogy about the war on terror, that institution is the state, the state, and the state: American power, with its long reach, its credulous belief in its own good intentions, its quenchless thirst for control, its devotion to expertise and system, and its heavy consequent burden of incompetence. The Oath is perhaps the most unusual of these films, for the weight of the thoughts it provokes about good and bad faith in human and political dealings, thoughts one may find oneself returning to long after the closing credits. Probably the reason for this complex effect is that Abu Jandal is the most ambiguous of her three protagonists. In any case, the pieces of the trilogy fit together inescapably, and they are best seen and understood together. They look at the mystery of courage with a complexity worthy of the mystery. How does a person apparently trapped by circumstances that compel one kind of action break with the routines of his previous life and act in another way? At the heart of all three films are men whom conscience drives to an improbable choice. Yet the picture offered of their courage is connected with another interest that may run deeper. These films about the doctor, the taxi driver, and the data worker in the war on terror in their different ways tell a single story about human freedom. President Obama, assuring the American people that “my team” vetted the surveillance system in 2009 and “scrubbed” the faulty parts, was telling a half-truth at best, but there is nothing surprising in a president not telling the truth. What may be harder to understand is that he had so little curiosity to learn the truth andact on it. The president handed the work to an inside legal team and eventually a commission or two and did not sack the heads of intelligence who took us far on a questionable path and lied about it. Meanwhile, the attorney general indicted Snowden on a charge of treason. In their self-protective understanding of the duties of high office in the national security state—in their refusal to face up to and reform the ungoverned exercise of power that Snowden revealed—Obama and Holder acted in a way that showed them to be profoundly unfree. So, too, did the generals, Keith Alexander and James Clapper, when they spoke under oath to Congress with so little regard for the importance of truth in a system that depends on informed consent. The strangest revelation of Citizenfour may therefore be this: Snowden, in his hotel room with his journalistic confidants Greenwald and Poitras and MacAskill, affords a picture of a free man. It shows in his posture, and in a sense of humor touched by self-irony. He is not haunted by any fretful concern with what comes next. He is sure he has done something he chose, and sure that someone had to do it. He acted in obedience to a principle; and it was right that the actor should disappear in the action. Citizenfour, by simply using the real-life actor as a way to consider the nature of freedom, honors the premise that moved Snowden to take his unique and drastic step. “The final value of action,” wrote Emerson, “is, that it is a resource.” It is up to other Americans now, the uncertain end of Citizenfour says, to rouse ourselves and find the value of Snowden’s action as a resource.